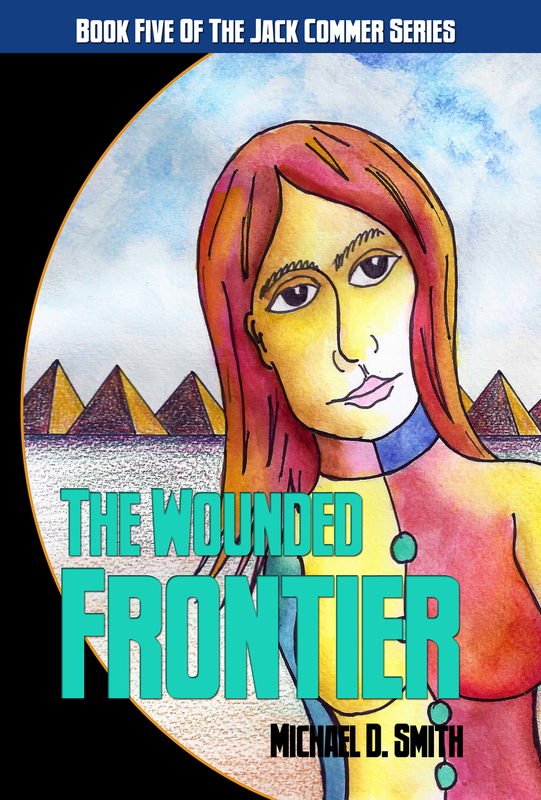 Still working on the second draft of The Wounded Frontier in June 2013, I again wanted a fast image to plaster to the beginning of a draft EPUB version. But this time I knew I could do better than the jokes I’d used for Nonprofit Chronowar and Collapse and Delusion. I’d made a cover for publication once before, for my novella The First Twenty Steps, but I’d never considered trying to compete with a professionally designed Double Dragon Publishing cover. Besides, I hadn’t even submitted the novel to DDP yet. At the time I was drawing panels to illustrate my sixth grade conception of a novel, Trip to Mars, and I chose this image of Jack and Joe Commer about to embark on a scouting mission to Mars in the aftermath of a nuclear war that has rendered the earth uninhabitable. 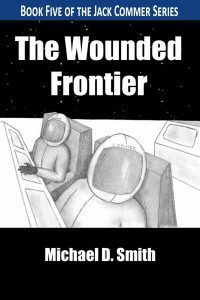 Minor digital edits added stars along with a stark black and white framework, and I made the title and author clearly readable even in thumbnail size; this was a problem I’d never resolved to my satisfaction in the Twenty Steps cover, or any draft cover for that matter. So The Wounded Frontier cover was something of an education. I get it that copilot Joe’s arm looks too stiff, and Jack’s neck comes across the same as he swivels to face the viewer. But these guys are filled with anxiety; upon them rests the fate of the 2033 evacuation of an entire planet! No wonder they’re awkwardly posed as we intrude upon their countdown. When the time for final publication came in February of this year, I sent publisher Deron Douglas some character images I’d been doing over the years. I was honored that he chose by far the best in the batch, the watercolor of Colonel Laurie Lachrer. This was one of those special gift images that had emerged effortlessly; it also perfectly defined Laurie to me. Her quick and light treatment went hand in hand with the idea of taking a minor figure from Book One and making her a major series character, and The Wounded Frontier opened up new energy for the series as a result. However, I still expected that Deron would use his digital editing skills to improve the image, executed on rough paper and flaunting its colored pencil and watercolor nature. So I was surprised and delighted to see it unchanged in the published version, simply well cropped to the curved series frame. Definitely a superb cover. Jack Commer pushes for exploration far beyond Sol in the untested Typhoon V when a star thirty-four light years away abruptly vanishes, leaving the infrared signature of a Dyson sphere apparently built within one week.